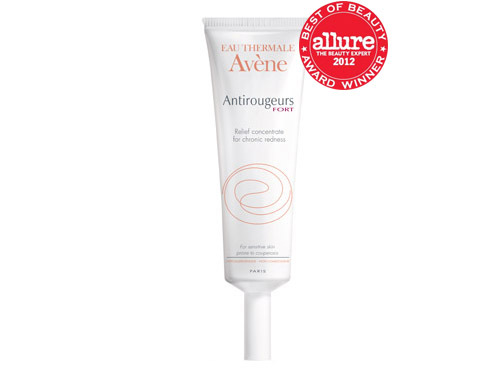 Avene’s Antirougeurs FORT Relief Concentrate. Now, this little tube is not the cheapest so I was really hoping it would be everything Allure claimed it would be. I’ll cut straight to it – after using this twice (almost) daily for about a month, I decided recently to chuck it. Maybe it works for other skin types, but it wasn’t so great for me. Actually, it usually left my cheeks immediately redder than pre-application and was too greasy. It just wasn’t worth another two months to see if this would eventually do something, so I give this one a thumbs down. The other product that left me saying “WTF?” was First Aid Beauty’s Anti-Redness Serum. Luckily, I was smart and tested this in the store, which was a great call because it straight up irritated my face. I read some reviews saying this serum does the opposite of what it says, and I agree. Don’t think I’d leave you on that note like a negative Nancy, friends. 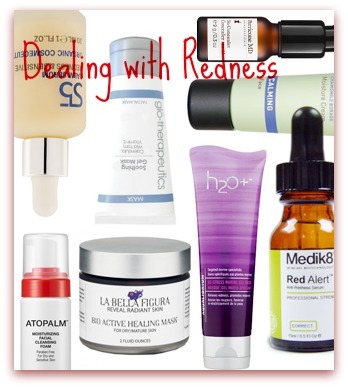 The following are the products I’ve found so far that actually do help with redness! 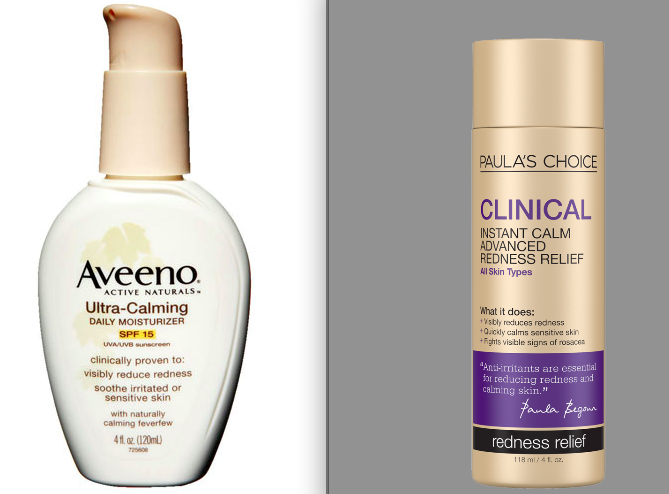 My two favorites currently are Aveno’s Ultra Calming Daily Moisturizer Broad Spectrum SPF 15 and Paula’s Choice Clinical Advanced Redness Relief. I’ve been using the Aveno as my daily moisturizer, since SPF is key for sensitive skin. This stuff is great because it’s soothing, light and doesn’t clog pores at all. Paula’s Choice Redness Relief is more like a toner, which you can just swipe all over your face with a cotton pad. You gotta stick with this one to actually see the benefits, as it accumulates over time. This one pretty much soothes on contact & can also be used by the fellas to soothe after-shave irritation! Both of these products are affordable and the commitment-phobes out there will be pleased to know that you can order a sample of Paula’s Choice before committing to the full size. I have found Eucerin lotion/cream works beautifully on sensitive, red, irritated skin.